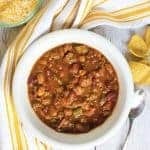 Instant Pot Italian Sausage and Bean Soup is a delicious, hearty meal that is full of flavor and easy to make! 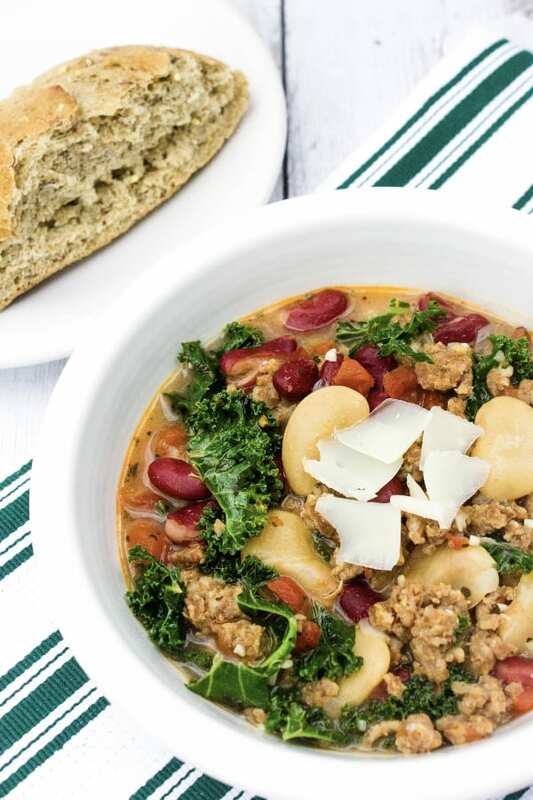 Because it cooks in the pressure cooker, you can enjoy this quick and easy sausage and bean soup with kale even on a busy weeknight! In case you haven’t noticed, I have a thing for homemade soups. 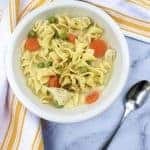 It wasn’t always this way–I used to grab a couple of cans of soup during every trip to the grocery store. 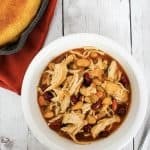 But once I learned how easy it is to make homemade soup, all sorts of soups began making an appearance on our weekly meal plans. 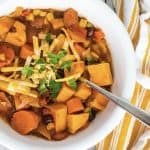 I love making soup for quick, hearty meals, and I appreciate how easy it is to make soup from leftovers. 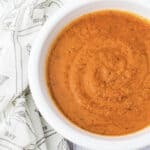 In recent years, I’ve started making Instant Pot soups much more frequently, simply because it makes it dinner a cinch! 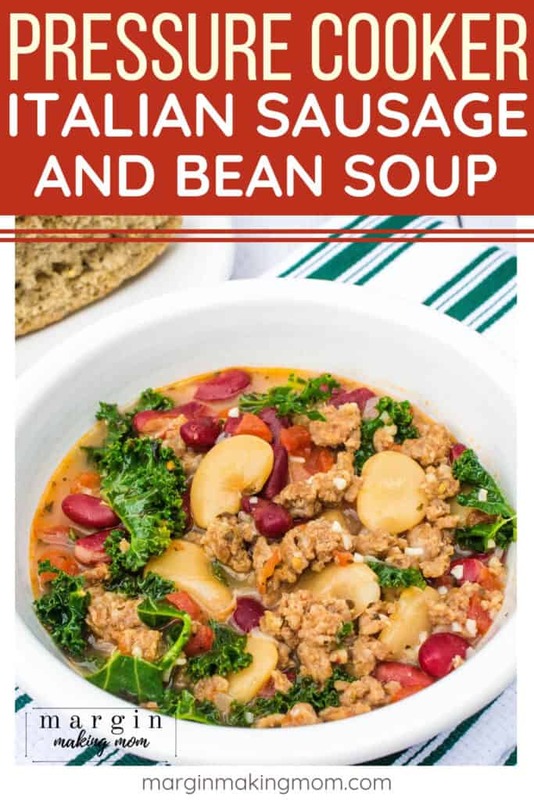 This Instant Pot rustic Italian sausage and bean soup is one of my recent faves. 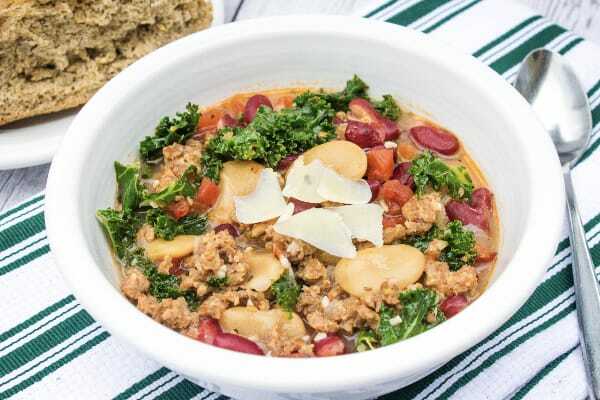 It’s a hearty, protein-packed soup that is easily customizable to your preferences. Not only that, but it’s ready in a matter of minutes, thanks to the Instant Pot (Don’t have one yet? You can get yours here!). I call that a win! 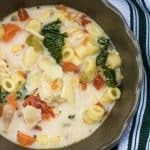 This soup is a spin-off of Instant Pot zuppa toscana, which is a favorite around here. 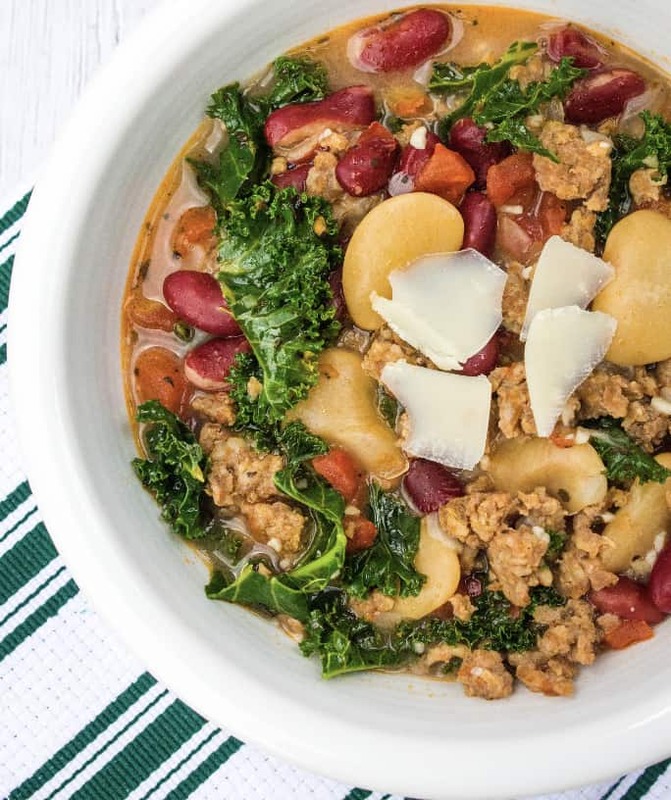 It’s full of flavor, just like the zuppa toscana, but has a few differences that allow it to stand on its own as a delicious soup option. I love the addition of butter beans and kidney beans alongside the depth of flavor from the sausage. Really, the sausage adds so much flavor that you really don’t need much in the way of seasonings here. I also love adding tomatoes and kale to pack in even more nutrients! Most of all, I love that it’s easy AND delicious! 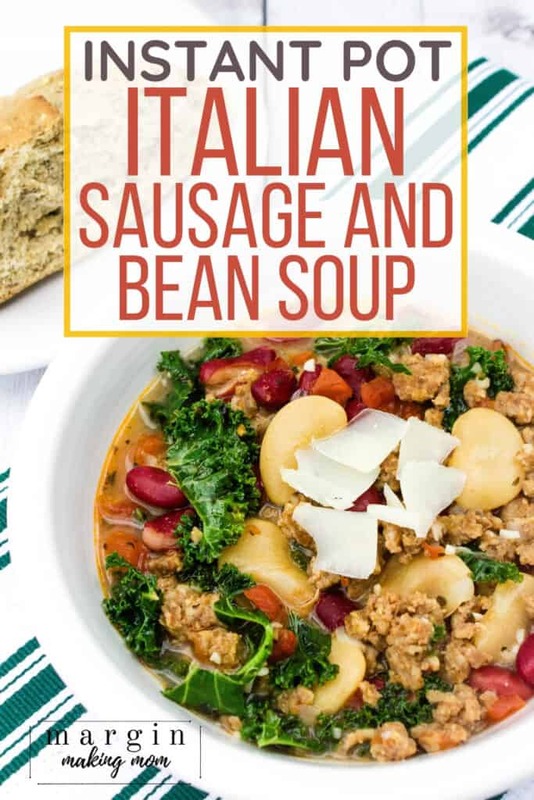 Making Italian sausage and bean soup in the Instant Pot is as simple as following just a few easy steps! To start, you’ll add a little bit of olive oil to the insert pot of your Instant Pot. Using the Saute setting, heat the oil and add in some diced onions. Stir those around and let them cook for a couple of minutes before adding the ground Italian sausage. Break apart the sausage as it cooks, browning it. Once the sausage is almost completely browned, add in some minced garlic and stir it for just a minute to allow it to warm and become fragrant. Next, follow the advice of this nurse and do your heart a favor by draining off the excess grease. Add Beans, Tomatoes, Broth, and Basil. To the sausage mixture in the insert pot, add some butter beans and kidney beans, some tomatoes, broth, and dried basil. Using the Manual/Pressure Cook button, select a 5 minute cook time at high pressure. Once the cook time is complete, allow a natural release of pressure for at least 10 minutes, followed by a quick release of any remaining pressure. Once the pressure has released and the valve has dropped, carefully open the lid. Stir in the kale and cream, allowing the kale to soften. Serve and enjoy! I use mild ground Italian sausage, but feel free to choose a different variety based on your spice preference. I like kale because it’s hardier than spinach and doesn’t get as mushy, but feel free to substitute spinach if that’s your jam. If you “massage” kale a bit before using it, it improves the texture. I just put a few leaves in the palms of my hands and roll them together, which softens them a bit. Adding a bit of cream adds a hint of richness to the soup, but this is absolutely not necessary. If you’re counting calories, are dairy free, or just don’t have any on hand, you can absolutely leave it out. If you want a substitution, you could try a bit of canned coconut milk instead. 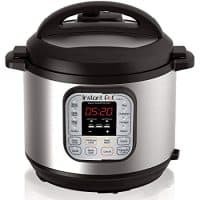 Instant Pot – I have the DUO60 model, which I love! In the insert pot of an Instant Pot, add olive oil. Select the Saute function and warm the oil. Add in the diced onions and stir for a couple of minutes. Add in the ground sausage, stirring to break apart as it cooks and browns. Once the sausage is nearly completely browned, add in the minced garlic and stir to allow it to warm and become fragrant. Drain excess grease and return sausage mixture to the insert pot. Add in butter beans, kidney beans, diced tomatoes, chicken broth, and dried basil. Stir to combine. Close the lid and set the vent to the sealed position. Use the Manual or Pressure Cook button to select a 5 minute cook time at high pressure. Once the cook time is complete, allow a 10 minute natural release followed by a quick release of any remaining pressure (you can also allow a full natural release). Once the pressure has released and the valve has dropped, carefully remove the lid and stir in the kale and cream, if using. Allow the kale to soften in the hot soup. Serve, topped with parmesan cheese, if desired! I like kale because it's hardier than spinach and doesn't get as mushy, but feel free to substitute spinach if that's your jam. I prefer to "massage" kale a bit before using it, as it improves the texture. I just put a few leaves in the palms of my hands and roll them together, which softens them a bit. I find that adding a bit of cream adds a hint of richness to the soup, but this is absolutely not necessary. If you're counting calories, are dairy free, or just don't have any on hand, you can absolutely leave it out. If you want a substitution, you could try a bit of canned coconut milk instead.